Soothe and soften dry, chapped lips with the Ultra Repair® Intensive Lip Balm from First Aid Beauty. Fortified with a nourishing cocktail of Honey, Beeswax and Colloidal Oatmeal, the concentrated treatment attracts and locks in moisture, whilst conditioning and restoring comfortable, deeply hydrated lips. 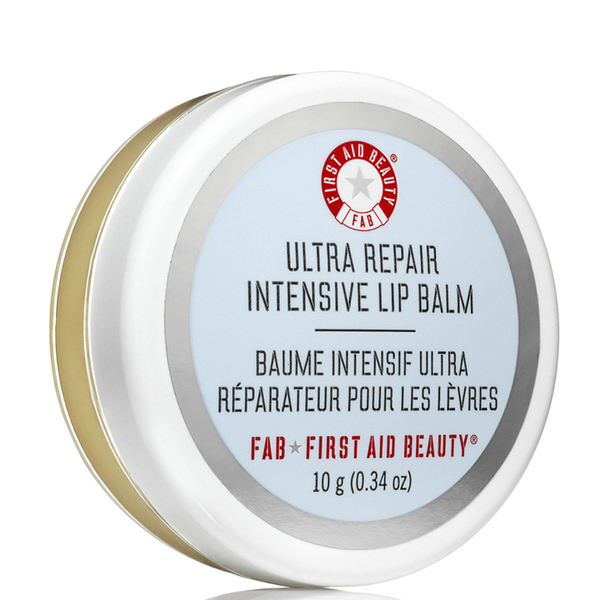 Forming a rich, buttery veil over distressed, damaged lips, the non-greasy balm is infused with a dose of Propolis Extract to instantly relieve, repair and protect from further dryness. Perfect for carrying in your handbag, lips are super soft, smooth and hydrated. Suitable for sensitive skin. Free from parabens, harsh chemicals and colourants. Use in the evening before bed or as needed to relieve dry, cracked lips. Cera Alba (Beeswax, Cire d'abeille), Carthamus Tinctorius (Safflower) Seed Oil, Aqua (Water, Eau), Prunus Amygdalus Dulcis (Sweet Almond) Oil, Butyrospermum Parkii (Shea) Butter, Lecithin, Theobroma Cacao (Cocoa) Seed Butter, Caprylic/Capric Triglyceride, Glycerin, Flavor (Aroma), Triticum Vulgare (Wheat) Germ Oil, Colloidal Oatmeal, Urea, Honey (Mel, Miel), Chrysanthemum Parthenium (Feverfew) Extract, Camellia Sinensis Leaf Extract, Glycyrrhiza Glabra (Licorice) Root Extract, Propolis Extract, Allantoin, Vanilla Planifolia Fruit Extract, Butylene Glycol, Caprylyl Glycol, Phenoxyethanol, Leuconostoc/Radish Root Ferment Filtrate, Sodium Hydroxide, EDTA, Eugenol.